John, You are a Genius. After all that fighting that I had with my OTL, …. The thing is, Power = Voltage x Current. You can not escape this obvious relationship. So there is a conflict of interest, within the OTL domain, stemming directly from that formula. ad a). 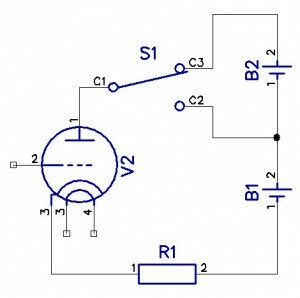 The low anode voltages translate into a very low output power capability. The higher the voltage, then the higher the amount of POWER being converted into HEAT on the anodes of the tubes, at any given value of current, set as exactly above. So by increasing the voltage on the anodes, even when the idle current is at the same value, you are already increasing the amount of heat that the tubes shall be dissipating. Obviously, if you start pumping some excessive music power into the speakers, the idle current (times voltage) is the current that you need LEAST to worry about. The current of the music signal is the real problem … just remember to multiply it by the anode-cathode voltage of the OTL tube. ( P = I * U .. Remember ??). 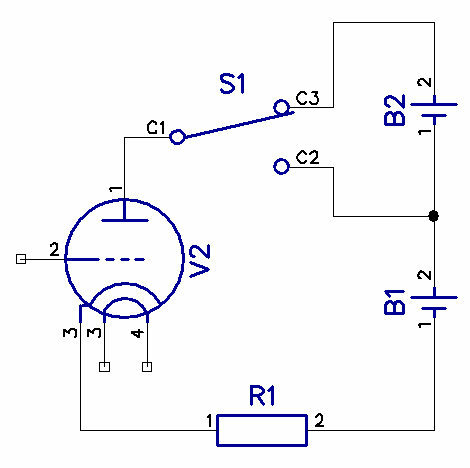 Two amperes of current flowing through a speaker does not yet mean significant “music” power. But two amperes times few tens of volts would essentially mean melting your tubes. The solution presented by John on tubecad.com is a simple, yet not so obvious solution so as to how to get the best of both worlds. A solution to solve the inherent OTL overheating output stage dilemma. Allow the anodes to work from a LOW value of voltage. That provides you with some LOW power of the music signal and the listening pleasure. Statistically speaking, for most of the duration (c.a. 85+ %) of your favorite songs, provided the music that you fancy is not of the heavy metal or punk or rap variety, or some yet other highly compressed type of music content. What about the “remaining” 15% of the music content ? Every once and again, a percussion is slammed. A drum. A big bass beat. These are the situations, where your low voltage on the anodes would render the output stage hopelessly incompetent in processing the sudden increased power demand. By the way, a demand that lasts only but for a few seconds. And on average, such loud transients take place in no more than 5% to 10% of the music content. At least in the kind of music that I listen to. 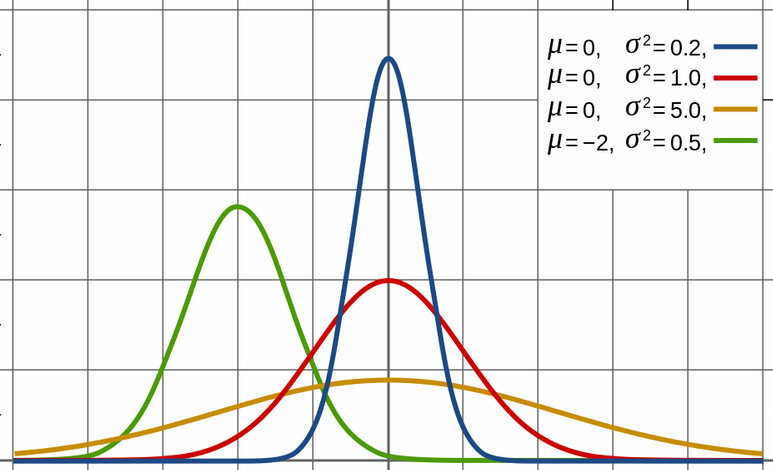 The statistical distribution of the power is very much similar to Gauss Curve. 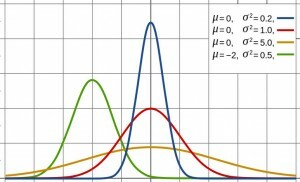 (The drawing – as sourced from http://en.wikipedia.org/wiki/Gaussian_function). The horizontal axis of the curve – imagine that it is the power level. The vertical axis of the curve is what we could call the “density of probability”. The surface area under a specific section of the curve, up to the power of “X”, is the actual probability, (or in the time domain: the “fill factor”, or “percentage of total playing time”), that the music will have a power of at least “X”. Intuitively, this is sort of obvious. The majority of the music content comes at a level as represented by some “middle” value (center hump of the graph), a ”middle of the road” power rating, the exact location of which is actually a consequence of your volume setting. But having a specific volume level set, the location of this hump is constant. The hump is the place where all the “mainstream average” of music power sits. Every once in a while, you also get total silence (as on the left side of the hump), such as the gaps between individual tracks. But then again, every once in a while, you also get a burst of power, one which imposes a significant rise in demand in terms of current draw (the area to the right side of the hump). But, as can be seen, the density of probability of such bursts is low. The higher the power of the burst, the lower the probability, that it will ever occur. Just to visualize the concept, let’s take an example: The density of probability of a peak of a million watts is virtually zero. In case of occurrences of a very high current demand, occurrences that take place very occasionally, are very few and far between, John applies an “momentarily higher value” of anode voltage supply. During such occurrences of sudden current DEMAND, a higher voltage source kicks in and boosts the anode, simply by means of being provided via an alternative power supply path (G-Class), or simpler still, by a MOSFET device on top of the anode, one that conducts more during such peak demands, allowing more voltage on the anodes. Actually, the schematics that John came up with, these are even more cunning than the above said. In the end, he departs from the zener diodes concept and comes up with what is indeed, a true “head scratcher”. A masterpiece. Some time ago, I was actually fiddling around with the concept of a class G amplifier, but in the context of some mosfet amplifier design. But at that time It simply did not come to my mind to even consider a Class G solution for my distressed OTL. Not even to mention THESE newly suggested variations, as you shall find on tubecad.com. In order to fully appreciate what is being presented, in terms of the value, you would actually need to have witnessed, experienced, a melted a hole within the glass of your output tubes. So, if you have seen the sight of an exploding overheated output tube, with red-yellow glowing anodes, and with molten glass sputtering everywhere, glass that burns holes in everything it comes in contact with, then this “OTL in Class-G” article is something definitely of value for you and worthy of reading and consideration.